Reviewing speakers is always interesting simply because until they are plugged in you've no idea how a particular pair will sound. Not only that but the differences in presentation is generally so large that doing tests reveals gross differences and character – no more "dancing on the head of a pin" to try and split two almost identical CD players for example (I hate that). No, here you can write with confidence about variations in presentation that you can hear from the next room. Likewise dealers must find speakers the easiest component to sell to a customer, for precisely the same reason – they don't have to "guide" their prey into hearing tiny differences, but can swap speakers around until the preferred balance and presentation is found. But in reality it isn't that easy, because those small differences between source components can, after a few weeks, be the difference between a customer that is happy and a customer who turns his/her back on hi-fi and buys a new flat-screen. On the other hand the gross differences between speakers fade over time as the ear become habituated to a particular balance. This is why a fundamentally unbalanced speaker (Horns spring to mind) may do badly on first acquaintance because their presentation is so alien, but on further listening may reveal talents that are hard to live without. You can do a simple test at home. Take a pair of speakers which you consider bright and replace your normal "balanced" speakers. They will be tough to listen to, but bear with me and give them a week. Now go back to your old pair and you'll probably find them unbearably dull. However if that pair of speakers sounded bright because of treble distortion, they will always sound bright and uncomfortable – the ear will never habituate. I have to say though that the ear is best at adapting to tilted balance and relatively gentle peaks, if you've a speaker 10 dbl up at a very narrow frequency this is always going to dominate. What I'm trying to say in a rather convoluted way is that a ruler flat response is one of the least important parameters in speaker design (especially considering what room modes will do to it...), especially if in order to achieve this the result is compromises elsewhere. The classic example is the use of hugely complex crossovers to force a speaker to measure flat – the losses involved can make the speaker veiled, undynamic and with phase problems. I'm not damning all such speakers by any means, and some have been very successful. This philosophy, typified by the "BBC" sound has held sway in many countries, but nowadays an increasing number of manufacturers are thinking out-of-the-box and producing radical speakers that put other aspects of a speakers performance ahead of the most basic technical measurements. Trivox are one of those companies that are trying to produce speakers a little different from the common herd. In particular they are fans of running the main driver as a full-range unit, covering almost all the audio band without any crossover. Personally I was sold on such drivers long ago, and in this case Trivox run the main driver right up to a 12 dbl crossover point at 7000 Hz. That is very high – most 2-ways crossover around the 3000 Hz mark, right where an awful lot of music is. So right in the middle of female vocal you have two fundamentally different drivers trying to mate up whilst the signal is pumped through meters of wire and banks of capacitors. In the case of the Trivox all the fundamentals of music are produced by that one driver – on top is what is best described as a supertweeter – just there for the tinkly bits. Sounds easy but where most mid drivers can reach 3000 Hz, to more than double that requires a very light stiff cone, a powerful magnet and very careful assembly. In the case of the Pure S this is a wholly in-house designed and built 170mm paper cone with a big drive system and very substantial chassis. This sort of engineering doesn't come cheap... 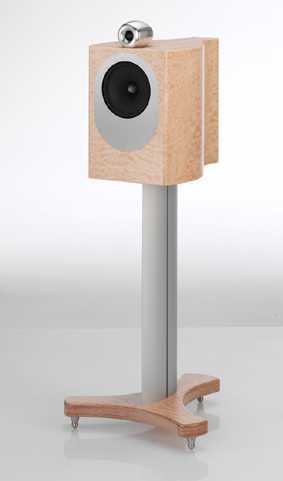 The supertweeter is mounted in a machined pod on the top of the speaker – this stainless steel pod adds substantial mass at a critical spot, gives the tweeter its own chamber to work in, and allows about 25mm of forward/backward movement thereby giving the user the option of tweeking this to get the best phase response on the listening axis. Again in-house this is a soft dome tweeter. The simple crossover is also designed and built in-house with the British made capacitors being the only non-German component. The story goes that the two men behind Trivox, Gernot Grabosch and Daniel Erlemann were messing about in the studio when they too noticed the power of these drums. A couple of hours later they'd cut out the skin and mounted a driver and the rest – as they say - "was history". Lately I've tried to avoid reviewing speakers because I've got so used to my own horns that I simply prefer them over anything else I've heard. Add the fact that removing them is a major happening and I hope you sympathize, but Norbert Lehmann of Black-Box fame told me the speakers were brilliant so in the end I relented. First off I did what I usually do and measured them in my listening room with my own crude equipment. 1M on axis the result was resolutely mid forward – 6 dbl centered around 1.5 kHz. This rather humped response was however very smooth (see discussion above) with no sharp peaks. Bass rolled off pretty fast and hard being well down from 200 Hz onwards. Sort of an OK result, but moving to in-room, with the speakers 1m out from the corners, both driven, the response was truly excellent. The rear firing port which had been lost on the 1m on-axis result filled in the bass so that the speaker measured flat +/-3 dbl from 80 – 4000 Hz, a very very impressive result and more what I'd expect from something more conventional. Bass dived for the floor below 60 Hz but after all we're looking at a small sound-mount. Not only that they appeared to be highly efficient and easily driven. Thus in this case at least the decent response curve has been achieved by unconventional means. King James – Sheffield Labs direct to disc - "Bit cuppy, good image, very clear, good ambiance, very coherent, bit dry/bass light, V tunefully – no resonances,"
Simply Red – Sad old Red - "Very even bass, good cymbal, nice vocals, shlap of hi-hat well handled, very good allround. VV good, tremendous dynamics for a small speaker"
And there dear reader you have the raw "unspun" first impressions, and they tell you 90% of what these speakers are about. There is a hint of cuppy/papery colouration especially on some female vocal (though this reduced with time), the ultimate bass response is inevitably limited, but by god these speakers grab the music and give you the 100% full fat experience. I don't want to overstate the case but the dynamics of the 'S' would leave most big floorstanders standing, and this is combined with a small, low mass cabinet (compared to a floor stander) that truly stops and starts on a sixpence. This ability means that details so often masked in a general warmth from a box, or smothered by a crossover just jump at you. I can see some people finding this forthright presentation too much on initial exposure but give these speakers time and they will rearrange your priorities and probably make you current speakers sound like the swamp monster. This is a characteristic of several wide band speakers I've heard, but all of these were horns of one form or another – I have never heard a box speaker come close to this. Now I could go on about the fine imaging, again a product of a small stiff box and a near point source, but it isn't the thing that will hit you first – no it's that dynamic delivery combined with the sheer clarity that grabs you. I've mentioned the downsides but the bass issue can be addressed by a Sub, albeit a very fast and thus expensive one. It will only have to tickle the very lowest frequency so should be easy to integrate, here a REL Stadium did sterling work, but to be honest I rarely found bass depth an issue even with it switched out. It also compromised one advantage of these speakers in that they are easy to place and unobtrusive (though some of the veneers available are both dramatic and beautiful), to the point where my wife began to mutter about swapping them for my "coffins" (Loth-x Polaris horns) so that she could have a swathe of the living room back. But one last thing. I'd been driving them with some seriously expensive valve amps, replacing them with the Lehmann "Stamp", a 20 watt digital amp retained almost all the attributes of the speakers at the fraction of the cost. True the result wasn't as sweet and textured but the soundstage even wider – certainly a fine pairing for the outlay. The Trivox Pure 'S' are unusual speakers, out of the mainstream and almost wholly built in-house in Germany, this of course makes them expensive. For the money you could buy any number of well regarded floor standers with a more conventional presentation. However in terms of dynamic ability, bass speed, midband projection and coherence very few of those aforementioned speakers would come close. Take these abilities, ease of drive, the superb build quality and elegant design and these quality stand mounted speakers make a very strong case for themselves. My only comment would be that if you are used to more mainstream speakers then they need a long audition so that your ear can adjust to their dramatic presentation and they are certainly not a candidate for a "blind buy" - but I loved them..